For sale here is a new wallet entirely hand made by me at my workshop in Yorkshire. It's made from whisky coloured kangaroo leather. 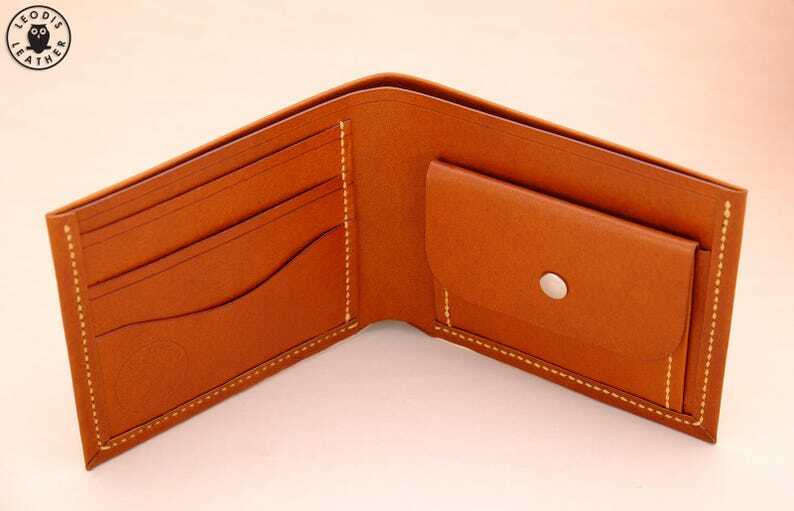 Kangaroo is a strong, luxury leather with a nice grain which is very well suited for making wallets. The wallet measures 9.5 x 11.5 cm when folded and is sized for UK paper currency or smaller. A UK £50 note is 85mm high so for example US bills which are smaller will fit no problems, Euros are also fine and so on. The wallet has 2 card slots, each slot will take up to 3 cards for a maximum of 6 cards in total. There is also a pocket behind the card stack and a single notes section as well as the coin pouch. The edges have been carefully double bound to give a nice edge all the way around and a beautiful roll to the inside binding. It is saddle stitched by hand with colonial tan tiger thread and should last a long time (tiger thread is very strong and the best all round leather thread on the market today). There are no machine sewn seams to wear out here! SECONDS INFO: please note this wallet is a second as it has a single pulled stitch on the back (this is where the thread pulled through the top layer of leather so it looks like a missing stitch in the stitching run, although it is there just under the surface). 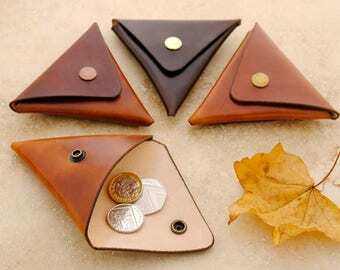 This wallet was filmed for a video and as always when I'm trying both film myself and do the leatherwork at the same time I make little mistakes! This is a small cosmetic issue only and will not affect the wallet in any way; the wallet has been reduced by ~25% to account for the issue. Lovely meticulous work by Ian. Highly recommended. After I bought this pattern, I thought for a few minutes that I took on a project that exceeded my beginner skill level. But I followed the written instructions (which were very helpful and detailed) AND watched the video once before I started my project, then watched in “build along” mode. The pattern is perfect. The instructions fantastic. I really feel I upped my game after completing this. I’ve watched Ian Atkinson’s videos for a long while. They have been invaluable. I’m glad I bought this pattern. Just super. El archivo es muy claro en su contenido.